One of the most annoying stages of doing your laundry is ironing. Luckily, you can avoid it either by relying on professional ironing services in London or by using some lavender oil. The latter solution is quite budget-friendly. All you will need is to buy some lavender oil. Put one teaspoon of it in a litre of water. Pour it all into a spray bottle and apply some of it on your clothes shortly before you leave the house. In just a few minutes, they will be crease-free. Don’t believe us – try it out and you will see it for yourself! It is false to assume that if you put more detergent in your washing machine, your clothes will get extra clean. The only thing that you will achieve is spoiling the fabrics of your clothes. Excessive use of detergents can even ruin the colours of your clothing over time. That is true… but only if the alternative to that is to tumble-dry your clothes. Not all clothing items should be hanged. Knitted pieces, for example, can easily stretch when they are hanged to dry. 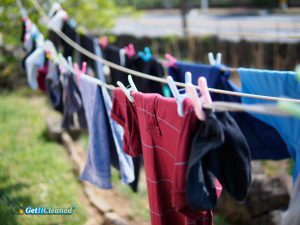 The best way to dry such clothes is to simply lay them flat on some surface in your home. We all know the unpleasant feeling of getting your favourite shirt stained. It is only natural to go the extra mile to ensure that we fully get that stain out and that mile often includes leaving clothes to soak in water and countless detergents for a night or even an entire day. However, there is no need for that because the mission of conquering a stain depends not on how long you soak it but how you soak them. In fact, there is rarely a need to soak them. Just prepare a paste from a detergent, soap or other cleaning products and apply it directly to the problem area. Leave it like that for about 5 minutes and then put it in the washing machine. Any stain can be defeated as long as you treat it immediately. Nope, it’s not. Your clothes will be just fine even without it. If you skip adding this product every now and then, you will not spoil the fluffiness and softness of your clothing items. In fact, you will do them a favour since not all fabrics can withstand the test of time when they are regularly treated with softeners.